A few days ago when I was setting the auto responder for welcome email, I was confused which welcome email templates I should use for the first email. 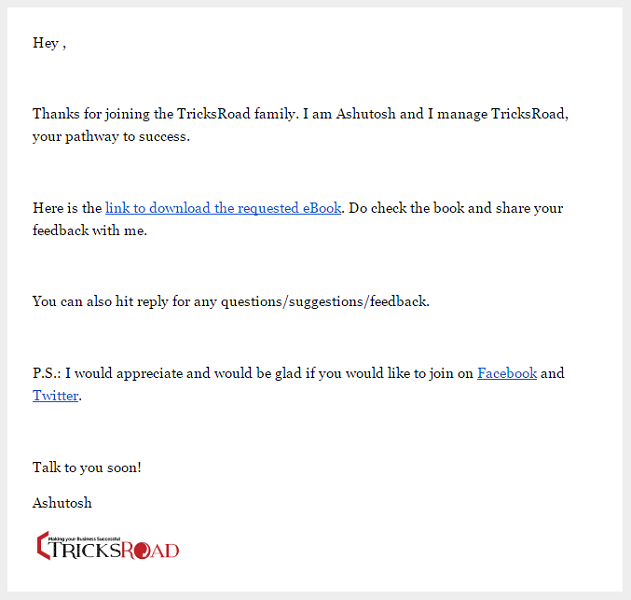 If you have subscribed to TricksRoad newsletter recently, you must have received a welcome email from my side. You can use any of these best email marketing services to set up the auto-responders. Such emails provide a great impression to your subscribers, and they feel that you are taking care of them. This is a great way to convert your visitors into subscribers. As from some great research it has been seen that people tend to join your list more often if you are providing some free stuff. Now coming to the main topic, welcome email templates. When I started designing my introductory email, I was bit confused as for how it should look. That time I just kept it simple and now changing a bit after checking 50+ welcome email templates, here are ten best welcome email templates for you which you can use to send an introductory email to your readers and customers. Here are some of the amazing designs for Welcome email templates which you can use for the introductory emails to readers, customers, and other users. These are simple, and with basic HTML & CSS knowledge, you can make a similar design. These are attractive and appealing. Also, you can experience some good CTR as well as responsiveness. 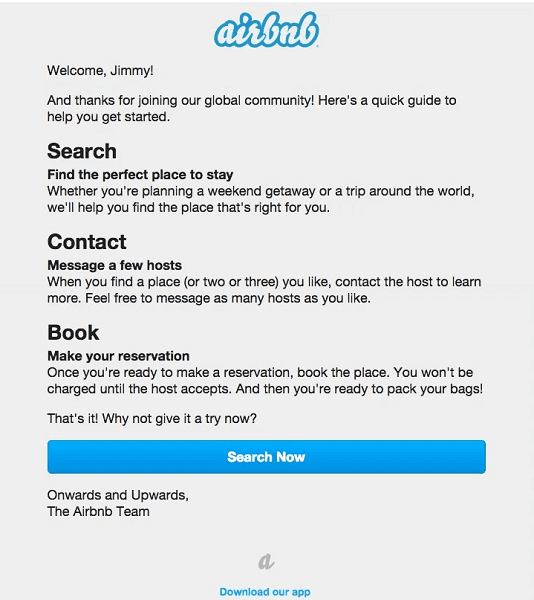 Airbnb welcome email template for a new customer is simply simple and amazing. Usually, new users are looking for some basic stuff like where they can search the items, book any hotel or how they can connect. All these sections are in the above email. The only thing I found missing is social media icons. One should also put social media icons in the introductory emails so that your new users can connect to you on social media. At the end of the email, you can also put if you have any mobile app like Airbnb has mentioned. Although Fab introductory email is bit long but contains all the details, a new user want. If users are reading these lines, they will get influenced, and this is a good sign for influential marketing. It has everything like site image, mobile app links, social media links, and important pages, etc. 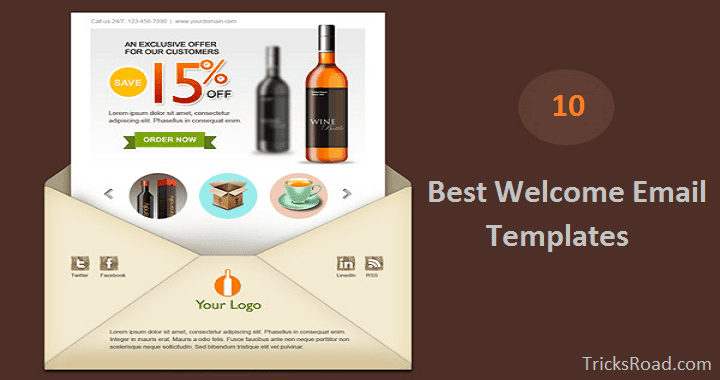 which make it a perfect welcome email template for new customers. 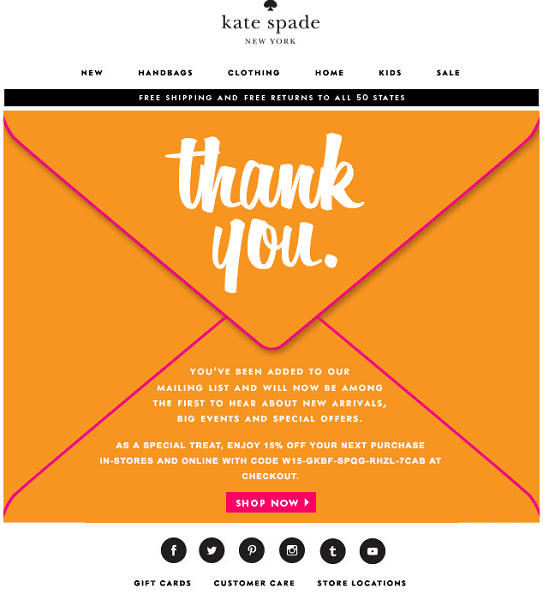 As Kate Spade is a shopping site and so their welcome email is directly like a call to action which is quite good. They are just thanking the people to subscribe and then asking if they want to shop. The design is very lucrative and appealing. They have social media button, important menu items and few other important links like a customer care gift card, etc. These are the things one want as an introductory email. Just see the wording of the email, after thanking the customers, they are also providing a discount code. Means it has everything one want and is compact. 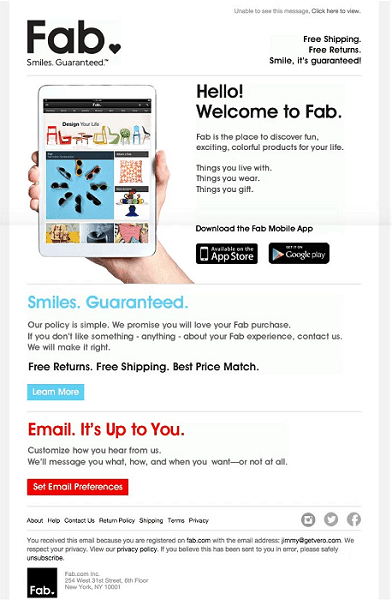 You can use this welcome email template for a new customer. 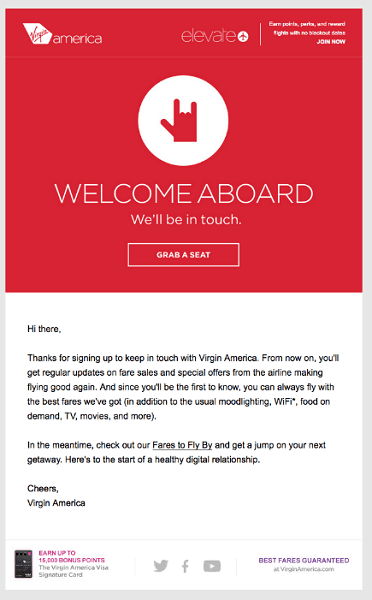 Virgin America’s welcome email is also compact and adorable. It has been designed on their main theme color, and that makes it even more beautiful. In the second part, they have put some message and few links. And in the footer part, they have their social media icons and a commitment message. 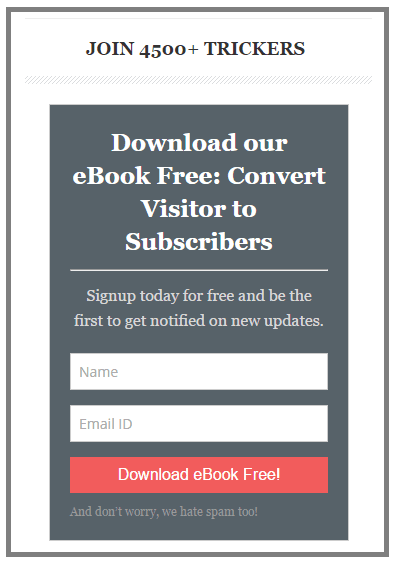 You can grab this welcome email template for your new blog subscribers. You can adjust the color as per your need and make it more beautiful. There is slight room for improvement is in the area of the font family. It is a good habit and great marketing strategy to make some introductory video for your new customers. 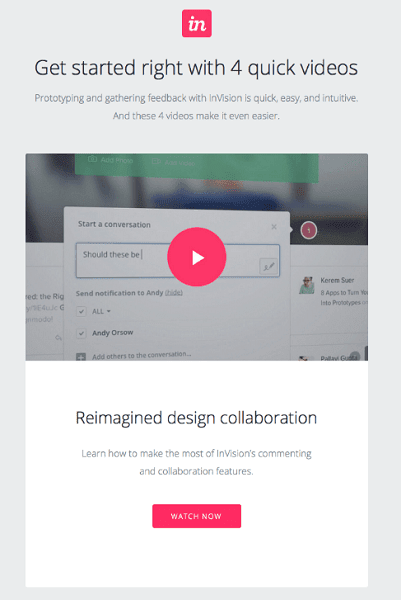 InVision has taken care of that side. They have their logo at the top and then an introduction video after a couple of lines. This is a great example or modern welcome email template. At the end of the email, a call to action button has been placed. Although I didn’t find the social media buttons, which can be placed for a better result. 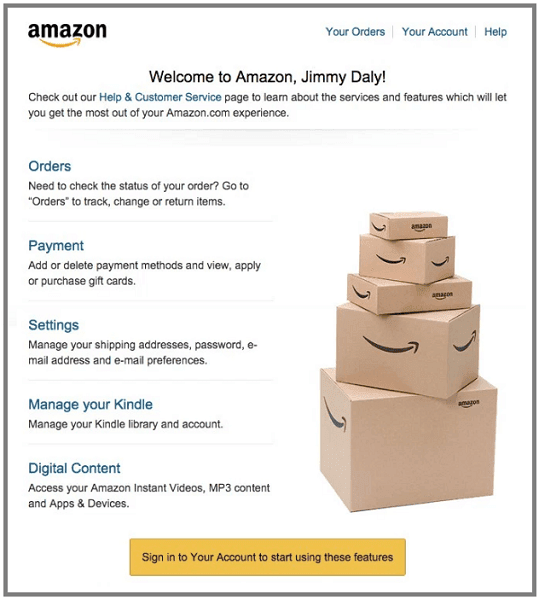 Amazon also has one of the notable welcome email templates for new customers. It is simple and possesses all the required details one need to get started with Amazon. All the initial stuff like Orders, settings, Payment, etc. have been taken care in this email which initial users need. 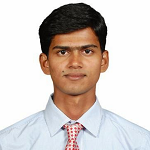 Few important links related to account management have also been provided. Only social media links have not been mentioned, which you can include. 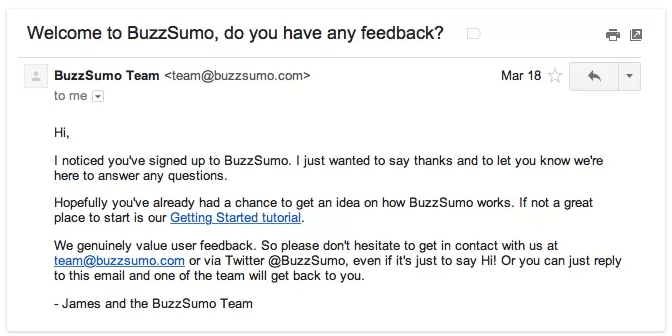 Buzzsumo uses a perfect welcome email template any blog owner will want to use. Although there are no images in the email, still it fulfills the requirement for introductory email. Even my current email template is also somewhat similar to Buzzsumo. First, they have thanked the new user and have placed a link to get started and then an email id for contact. At the end of the email, the Twitter handle has been placed and written appeal to say hi. When you ask your reader to say hi/or to ask a question by replying, gives a positive vibe. 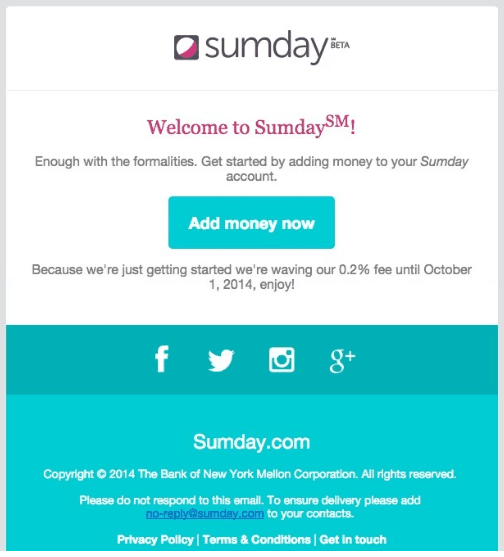 A small and appealing welcome email by Sumday can also do wonder. The company has welcomed the new user and then added one button to add funds. In the end, there is an offer. The company has highlighted the social media here and wanted their user to connect their as well. If you are looking for some fancy email, template for new users. It has been beautifully designed, and different sections have been incorporated here. For normal blogs, this can be too heavy, but if you have store section in the blog, then you can use such template. I am using a basic yet appealing welcome email template for the users. Newbie can use this and can get some good CTR. I have first thanked the user and then welcomed them. Then I have given the link to which they have subscribed using this form. Then at the end of the email, I have asked them to join me on social media. So this is also a compact welcome email template for new customers. These were some of the best welcome email templates which you can use for the new customers as introductory emails. Depending on the kind of business you are doing, you can use any of these introductory email templates. Take an idea from these email templates and tweak your own with the help of little HTML & CSS designs. Do let me know which email template you use for welcome email.